The energetic, remarkably well-spoken, 26-year-old Shai Eisenman is nothing short of a prodigy. 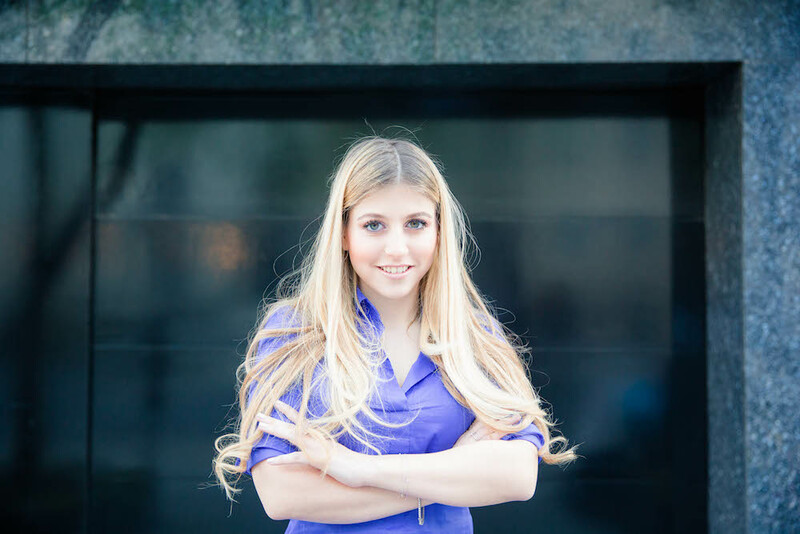 She finished college at the age of 18, managed an international company before the age of 20, and founded gift-giving company Ari & Elle in August 2017. She’s also the wife of a driven entrepreneur and mother of a very lucky daughter. How has she managed such success before the age of 30? We had the same question, so we invited her to sit down with us to talk about her entrepreneurial journey, and how her newest venture, Ari & Elle, is changing the gift-giving industry as we know it. Let’s start with a bit of personal background. You accomplished an impressive number of things before you turned 25. What all did you do? Well, I won’t go back all the way, but I started college at age 15 and finished when I was 18. I was already working fulltime at that point so I had quite the hectic life as a teenager. I’ll bet. What was the job? I was managing a bullet-proof plate company—the kind used by a lot of security firms. I was in sales mostly, which meant I was flying all over the world, talking to military organizations and governments. How on earth did you get into that line of work? It’s actually a family business. I was running my dad’s company. And then you transitioned into your first CEO position at age 20, is that right? Well, I volunteered with the Israeli military for a year first. But then, I started working for a company called Babylon as a business development manager. I was promoted very quickly, and ended up as head of compliance before moving on to another job as a manager of several companies for an Israeli tech billionaire. It’s hard to imagine that kind of success by your early 20s. It was also during this time that you met your now life partner, right? I actually met him at a security conference when I was only 18. He was—and still is—a very career-driven entrepreneur with his own company, so the relationship moved slowly. We actually didn’t think anything lasting could come of it, but it did. And after six years together, we decided to have a child. How do you manage parenting and a demanding work life? My partner and I both understand each other and we work very hard. He understands that my travel and schedules keep me working until 2 a.m. and I understand the crazy demands of his work life. Long ago, we decided that we would combine our careers and our parenting—not keep them separate. We look at it this way: Our daughter fits into our lives, not the other way around. That means we’re not changing our careers to accommodate her, but that we work together as a family to make our lives a success together. To make that possible, she travels with us, goes to sleep very late sometimes, and works within our schedules. But we also make sure she gets three hours with us every day. Have you faced any prejudice or disadvantage in your career because you’re a woman and a mother? I’ll admit—without shame or apology—that my daughter is the most important thing to me, but that doesn’t mean I don’t want to fulfill my career dreams and goals. When I first heard this kind of feedback, I wanted to apologize. In fact, I wanted to keep all of my private life away from work. But at some point, I realized that if the person I’m working with doesn’t understand how committed I am to my career and what I’m willing to do to make it a huge success, then it’s not someone I want invested in the company. We need more role models like that, I think. Hats off to you for taking that stand. And that’s a good transition, too, because it’s your commitment and vision that ultimately led to the creation of Ari & Elle. When did that launch? The company was started in August 2017, but we launched the website and app in June 2018. Oh wow—quite a new venture! Yeah, and it’s so much fun because we’re now starting to experience some customer love. That’s amazing to me because in all of my time running companies, there wasn’t a lot of gratification from people you were helping. What I love about Ari & Elle is that it’s all pure good—all we do is make people happy. Can you briefly talk about the concept? Sure. The whole idea behind Ari & Elle is to create a special, curated gift-giving experience that matches people’s personalities. It just makes the gift-giving (and receiving) so much richer. How did you determine that this was a good business idea? When I was living in London several years ago, I bought everything I needed online. At one point, I was shopping around for presents for a cousin and a friend. My cousin loved comic books, but I had no idea what I could get him that would fit that mold. And my cousin had just had a baby. I didn’t know what to get her either. I researched it, but couldn’t find anything. So, I decided to build the company myself—a gift-giving business designed around personalized gifts packaged in a very attractive way. That sounds like a huge win for a lot of people who don’t have time to put together thoughtful gifts. But how exactly do you figure out what fits the recipient? 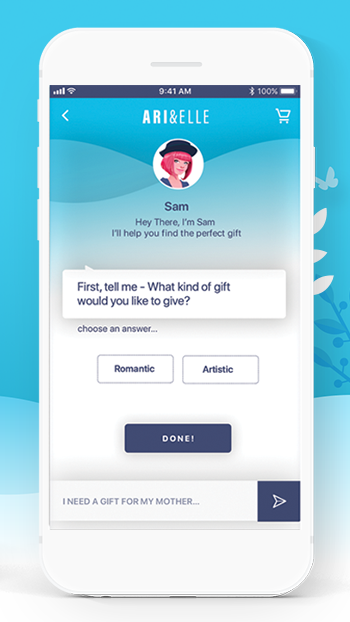 Based on the answers, the engine will then suggest several gift collections fitted to the personality the customer has defined. Do you have enough gift collections to match all of the possible personalities? I think we’re hitting most of them, and our selection is always growing. Right now, we have more than 800 different collections of more than 6,000 individual products. What kind of market research did you do to determine what you would offer and how you would deliver it? We went through a broad-scope research process at the outset and determined that 45% of the gifting market is taken up by holidays and 55% by occasional gifting—for birthdays, anniversaries, and so on. After we discovered this, we dug into the various occasions that might be important to customers. We knew that a house-warming gift, for example, is given in a very different context than, say, a get-well gift. So we wanted to see what has historically been successful for each occasion. This research inspired our gift collections, and we continued researching and building the collections until we felt we had enough to launch the business. Why is it necessary to create gift collections instead of single gifts? We want to tell a story. So, for example, we have a box called “Take Me to the Movies.” It includes a small projector, an inflatable couch, and a Bluetooth speaker. It’s a cinema in a box and offers a complete experience to the recipient. How did you land on price point? I noticed that many of the collections are $100+, which might be a bit steep for a casual thank-you or get-well gift. We’re still working on that. We definitely want to add more collections in the $70-80 range, because we know that some people are not going to want to spend more than that on a friend or colleague they’re not all that close to. You’ve also mentioned that you offer a picture of the final package to the gift purchaser before shipping. Why? The first impression is important, and we know that places like Amazon don’t let you know what a gift will look like once it’s shipped. We want customers to feel confident in the gifts they’re giving—both how they’re displayed and what’s inside. What kind of marketing are you doing to promote Ari & Elle? We’re advertising on most of the platforms you’d expect—Good AdWords, Facebook, and so on. But we’re going to be focusing a lot more on influencer marketing in the coming weeks and months. Part of the reason for this is that a landing page is a hard space to explain our service. But an influencer can show an audience how our service works and what you get. Their photos and videos can capture the unique elements of Ari & Elle. Are there any lessons you’ve learned in the development process that you can share with other entrepreneurs? Our industry is getting very digitally sophisticated. The data that’s available allows companies to find out exactly who is using their products and what their demographic information is. Because our products are so personal, we’ve tried to use that to create very targeted campaigns. I would recommend more companies do this. It’s more work, but the conversions are higher quality. Also, as you begin your company formation, seek out once-were founders who have become successful to help guide you through the process of building your own company. Thankfully, I did that and was able to avoid a lot of mistakes because of it. Lastly, don’t be in a rush to launch. In retrospect, I would have spent more time marketing and fine-tuning the user interface on the site and app. The small problems we saw in beta testing didn’t seem like a big deal, but they became a big deal when we went to market. And how do you keep happy customers coming back? What kind of ongoing communication do you have with them? Since we’re learning about our customers as they chat with our AI engine, we can reach out and ask specific questions about searches they’ve done without purchasing a gift collection. And even when they do, we offer coupons inside gifts to encourage potential new customers to sign up with us. We also offer discounts to customers who post unboxing videos on Instagram and other social media platforms. And, of course, we encourage feedback from customers if they have ideas on new gifts we can include. How do you plan to grow Ari & Elle over the next 5-10 years? We’re going to be focusing on two things: technology and merchandising. We want to continue to improve our AI engine so users can tell us exactly what they want. That will be an ongoing process. On the merchandise side, we’d like to round out our offerings with something that fits with almost every personality out there. As part of that, I hope to bring on a bigger team of researchers—experts who know specific careers, jobs, and industries inside and out. That will help us dig deeper into the diverse interests of our growing customer base and create the perfect gift collections for them. For more information about Ari & Elle, and to snag the perfect gift for an upcoming holiday or special occasion, visit ari-elle.com.